The ability to hold two conflicting beliefs at the same time. I know I have discussed this before, on this and other people’s blogs… but I do think it worth revisiting when circumstances change, or you see things from a different perspective. Is being an artist a vocation? I have an art teaching job, but it doesn’t feel like a vocation, just a job where I can wear what I like and keep my hands dirty. 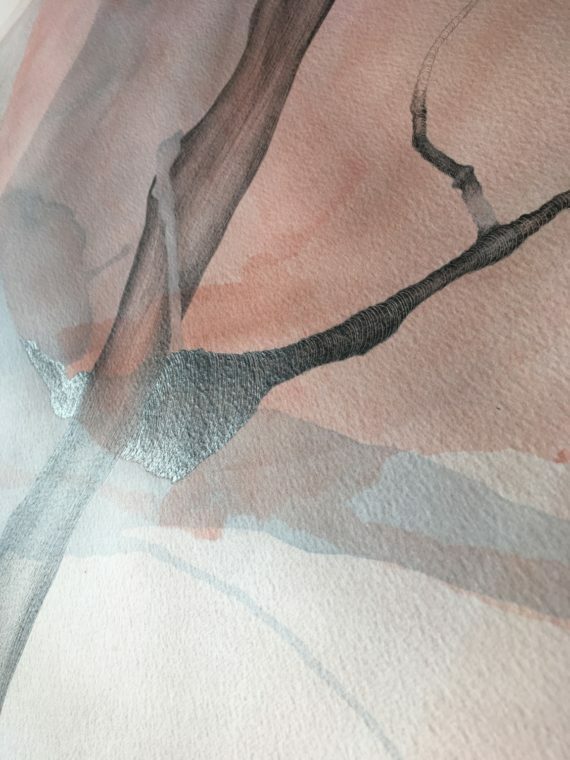 For me… it is a state of mind… I am perhaps very fortunate to have the job I have, where I can teach art, yet in doesn’t impinge too much on my own creativity, as I only do it part time, and as I teach in primary, not secondary school, I don’t have the whole exam scenario to deal with. A state of mind then. If I was stacking shelves, driving a van, sweeping streets, cleaning toilets, crunching numbers (god forbid!) or shuffling paper around an office, I would STILL be an artist. So is this where the cognitive dissonance sets in… should I be paid for having a state of mind? I believe artists can’t be paid. I am who I am, my ideas exist whether someone pays me for them or not, I make them, whether somebody pays me or not. But I work hard at this, so I deserve a decent wage. But where from? Who from? If someone wants my services as an artist, they should definitely pay me a decent rate of pay, everyone deserves that don’t they? Absolutely. But they are not paying me to be an artist really, they are paying me, usually, for something slightly different… they pay me to present my work in a particular way… they pay me to engage the public with my work… they are paying me to lend them my work to display… or they are paying me to teach or share my skills and ideas with others. If they were paying me to be an artist I would pick the cheque up, and stay here playing with bits of fabric and scissors and scribbling in my sketch book and thinking hard into the wee small hours till I fall asleep in the chair and wake up at 4:37 with a crick in my neck. I can do what I damn well please! If I want to stop making respectable clothes and stop making quilts and stop everything else in order to stitch the lyrics of a song onto a shirt then I will. Oh what a happy bunny I am! Why is stitching different to a drawn line? Why do I choose to stitch onto these garments, this fabric? I could write/draw on them couldn’t I? And sometimes I do, in order to keep the stitches from straying, then the drawn line is washed out. I could have printed the words. This is why I bought the book about semiotics, in order to think about (and maybe answer)these questions properly. I think it is to do with speed – or rather the lack of it. Sewing by hand shows my audience that I am serious. These words have importance. 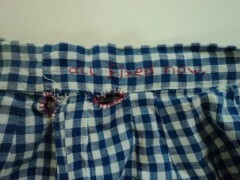 What I sew them onto has significance. The garments I choose have personal resonance. I might have worn them, my parents might have worn them. They are, for the most part, natural fibres, not man-made. Personal taste. Sewing onto a crimplene dress, for me, would be unpleasant to do. I would not enjoy it, and would not like the look of what I had made. Also, I am showing off. I have skill. I know it, I like other people to know it. That too, tells them I’m serious. 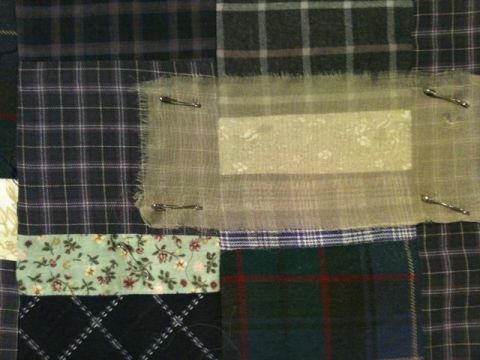 What I’m interested in here, with these items of respectability I am stitching, are the signs I’m using. I have said previously that I use the clothes as a shortcut/shorthand. 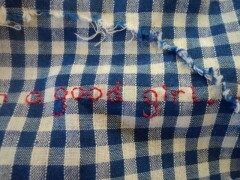 They say things about me, my background, class, gender, taste… so then it lends context instantly to what I stitch on. But I’m still asking myself, why stitches instead of a drawn line, or a printed mark? The “I think…” list above could equally apply to those processes. So what are stitches that a drawn line isn’t? Stitches go through, become part of. Stitches can fix other layers. 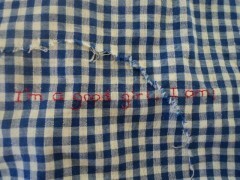 So the words I stitch become part of the garment, together they become something that wasn’t there before. The needle affects the garment, it could damage at the same time as it repairs. The words can be removed, and depending on the fabric, and laundry process, could leave no trace. Other layers can be attached, obscuring, or adding, emphasising message, adding further signs/messages/meanings. I think this discussion with myself is helping. I had originally intended that any text I wrote/stitched on this would be all over it. Lots. But in the end, didn’t. I must confess, Henry, I’ve not read it properly, but dipped in and out, here and there, it’s been a busy week… anyway… It has made me mindful about how I use my text. I hesitate to use the word cautious, as that’s never really been a problem of mine. (Lazy, yes, cautious, no). Words are powerful things, and I trot them out here, willy nilly, verbal diarrhoea as they say. I love them enough though, to be able to spell diarrhoea without looking it up. On my textiles though, they are precious things, they are thoughts, fleeting, captured and pinned down, an essence distilled. Each word is (usually) originally written, by hand, on the item in question, flowing, joined up, occasionally illegible, as my handwriting is prone to being. 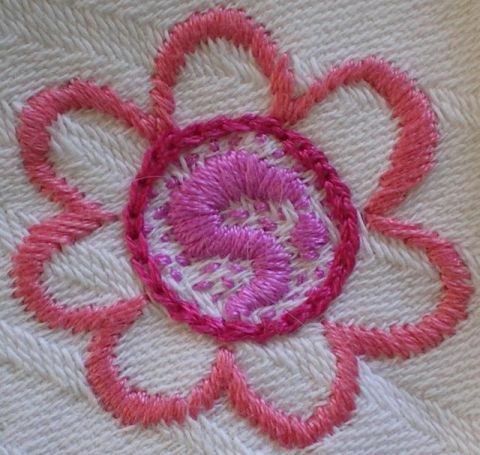 The hand stitching process is slow, a long word like diarrhoea could take an hour to stitch. During this time, the word disappears, I trust in my line, and stitch it. Meaning for me seems to deepen as I spend this time contemplating it, the next word, the context, the garment, and the point at which the garment becomes something else. It could still be worn. But is it now something else? I like my work to be touched, which, in a gallery situation is tricky. (Jacqueline, in her reading, described her feelings about touching art in galleries.) By continuing to touch it once it has become art, means that it remains garment as well as art… maybe. The words “I’m a good girl, I am” are emphatic, ironic, perhaps funny, with a hint of Barbara Windsor about them. “All fixed now” equally emphatic, but clearly untrue. The tears and holes might be prettier, but they are still there, and in fact, now more obvious than if I had left well alone. So now I am drawn to reading about semiotics. Goodness knows where that will lead me. Recently, the government have been trying to do things with the education system that messes about with the status of the arts in schools, and subsequently within society as a whole… our education system, after all, forms the society, tells our children what sort of society they belong to, tells them what is of value and what is not. Artists and art educators know the value of the arts. Our problem is it is a bit wishy washy when it comes to everyone else. Doesn’t art just sit on the top and make everything look pretty? Or in the case of contemporary art to many, not even do that? This morning I read something, about a piece of art, in a book about art. It is going to be difficult to write about it because it was deeply personal, and very specific. But actually, the specifics don’t matter. It is the effect it had that matters. I had a question, unformed, about life, the universe, and everything. It swam about in my head, crashing about, making itself felt in areas it had no business to be in. It was making me feel unsettled, uncomfortable, irritable too on occasion. I didn’t know it was a question until this piece of art was encountered. Life without art is impossible. How can we make them understand?